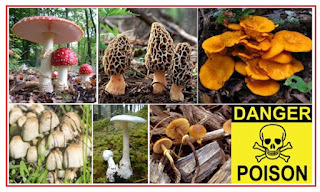 Mushrooms (fungi) that are unsafe (poisonous, or deadly), to us humans, are also unsafe for dogs and cats. Medicinal and editable mushrooms 1safe for human consumption, are generally 1safe and healthful for dogs and cats. Amanita (i.e. death cap mushroom). Little Brown Mushrooms (some or safe, some poisonous). May be dangerous, or cause allergic response. The above lists are extensive, but not complete – there are many more mushrooms that fall into the categories listed above. 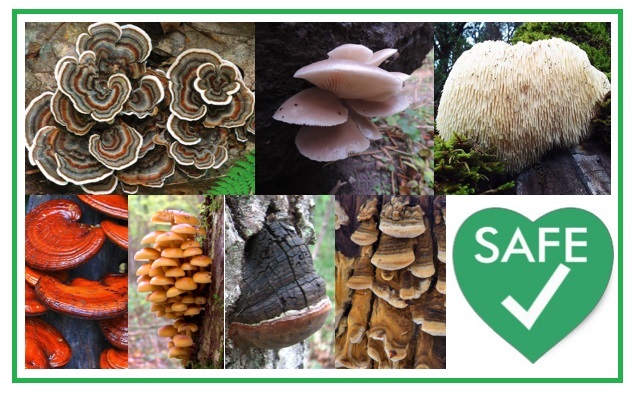 Organic or wild-crafted medicinal mushrooms (i.e. turkey tail, shiitake, oyster mushrooms, etc. ), and culinary mushrooms (i.e. button mushrooms, portobello mushrooms, etc.) offer a wide range of health benefits to 1dogs, and are also good for most 1cats. 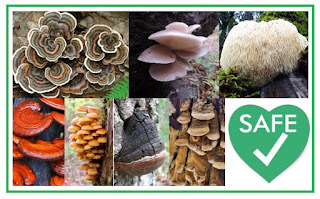 for a list of dog and cat safe medicinal mushrooms go here. Mushroom broth - for a dog and cat appropriate mushroom broth recipe go here. Bone broth with mushroom –add mushrooms to the bone broth 20 to 30 minutes before removing the bone broth from cooking heat. Fresh mushrooms added to a greens and veggie and/or fruit puree or smoothie. On a daily basis my dogs have mushroom broth or tea, dried mushroom powder or mushrooms added to their veggie/fruit puree. True story - my first dog knew which wild mushrooms where safe to forage and would self-harvest her own wild mushrooms. My current pack of dogs don’t self-forage wild mushrooms. When in your own yard, or hiking along wooded trails – if you are not confident your dog knows the difference between editable and poisonous mushrooms – monitor your dog and do not allow him/her to taste-test mushrooms and fungi. May have a sensitivity (intolerance or allergic response) to an editable, medicinal mushroom. May have a health issue that contradicts consumption of mushrooms. May be on a drug that contradicts consumption of a mushrooms. 🚶In-person Sessions only available in Ontario, Canada.